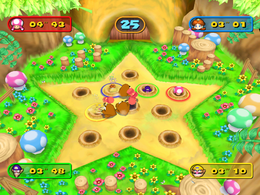 Monty's Revenge is a battle minigame that appears in Mario Party 7 and returns in Mario Party: The Top 100. Its name is a pun on Montezuma's Revenge, a type of traveler's diarrhea. The first player is looking around while in their hole, then they become surprised and get back in just before a Monty Mole hits them. 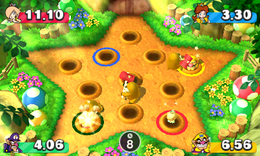 In a subversion of both the children's game, Whack-a-Mole, and the usual motifs of the Mario series, the players pop their heads out of holes in the ground and have to avoid being whacked by hammer-wielding Monty Moles. If a player gets hit, they are stunned and don't get any time for staying out. Whoever stays out the longest wins. This is one of the minigames that can appear in Decathlon Castle. Here, the player's objective is to stay out of the holes as long as possible to earn as much points as possible, up to a maximum of 1,000. In Mario Party 7, the winner does their winning animation while the losers are chased by the Monty Moles with hammers. If the minigame ends in a tie, all the players are chased by Monty Moles. Rules – "Peek out of a hole, but don't let Monty Mole whack your head! The player who stays out the longest, wins!" Advice – "If Monty smacks you in the head, you'll be stunned. Pull back when he raises his hammer!" Description – "Poke your head out the longest to win, but beware of Monty Moles with mallets!" On-screen – "Keep poking your head out without letting a Monty Mole hit you!" This page was last edited on March 27, 2019, at 01:28.